Inter-specific communication between humans and animals has reached its best with domesticated animals such as dogs, horses or cats. Experiments involving the localization of hidden food have underlined the understandable character of pointing gesture, gazing, body posture and voice. The effectiveness of the pointing cue increases when the experimenter is close to the target and when the signal is maintained and dynamic. Adding gazing towards the target or sounds improves the performances of the animal in finding it. Body attitude also triggers the animal's reaction. In general, dogs have the best communicative abilities and their attitude towards human seems to involve complex cognitive processes. The capacities of domesticated animals are the result of mixed genetic factors and life experiences. Origin of communicative skills: result of the long term domestication process? Origin of communicative skills: learning during ontogeny? Communication occurs between two animals when an observer can detect predictable changes in the behavior of one of them in response to certain signals from the other . Therefore, communication can be useful within the same species of course but also between individuals of different species. Inter-specific communication can for instance take place between animals living in the same ecosystem. The human species plays an important role in this field. Indeed, human has created a very specific kind of inter-specific interaction by performing domestication. Many attempts have been done throughout the past two centuries to define the domestication process. Darwin  first suggested that domestication includes taming and breeding of animals in captivity, is goal-oriented, could occur without man's conscious effort, may induce the atrophy of certain body parts, decreases plasticity and is facilitated by subjugation to the trainer. More recent definitions have pointed out the importance of conditioning to captive environment and management practices . One broad definition could be the one of Price : domestication is attained by some combination of genetic changes occurring over generations and developmental mechanisms triggered by recurring environmental events or management practices in captivity that influence specific biological traits. The result is that tameness towards humans and communicative skills are among the more important aspects of the domestic phenotype. Inter-specific communication has reached its peak between human and domesticated species: farm, laboratory and companion animals. In this review we will focus on the cognitive and communicative skills of domesticated animals that have had a long common history with man and that are specifically trained by man such as: dog ( Canis lupus familiaris ), horse ( Equus caballus ) or cat ( Felix catus ). Dog's behaviour is probably the most documented for they are present in nearly every human society and are also the earliest domesticated animal species . Indeed, fossil evidence show that the dog has probably been domesticated between 15 000 years BP and 30 000 years BP . Inter-specific communication is a very complex phenomenon and its modalities are often hard to interpret for conclusions can be very subjective. Therefore it is necessary to simplify the experimental procedures in order to minimize the number of cues detectable for the animal. Pointing gesture has been a basis for many behavioral studies. It is now well proved that domesticated animals such as dogs can use human pointing gesture to locate hidden food. It is pertinent to concentrate on the pointing gesture in human-animal communication because pointing is specific to human. Many experiments have been carried out around the pointing modalities that have been reviewed by Miklósi and Soproni •• (Cf Figure 1). Figure 1. Schematic representation of main pointing gestures. Schematic representation of main pointing gestures. The squares represent hidden food (in bowls, buckets or other containers). The usual procedure is to show the animal two containers in one of which food is hidden. Pre-training is necessary to be sure that animals are aware of the possibility for bowls to contain food. The pointing can vary in its duration, its form (arm, leg, elbow, stick...) and the position of the human who is giving the cue. Results are summarized in Table 1. We can notice that the studies didn't always pay attention to all the parameters that are presented here and which are now taken in account in every study. Therefore, the effect of some combined cues has not been studied yet. Table 1. Summary of results obtained in pointing experimentsa,b. Summary of results obtained in pointing experimentsa,b. a Experiments in which all the present parameters (gazing, duration and form of gesture) had not been specified are not reported in this table. The interpretation of the various experiments carried out is presented in Box 1. Three main parameters are taken in account: the form of the gesture, the duration of the gesture and the distance between the experimenter and the target. We can conclude that the effectiveness of the pointing cue increases when the human is close to the target (proximal pointing), if the signal is present until the subject makes his choice and when the animal perceives a movement during the pointing (dynamic pointing). Human usually points an object with the index from the contralateral hand (i.e. the closest to the object). All anciently domesticated animals (dog, cat, horse and goat) understand this kind of signal. Other types of more unfamiliar cues have been tested with dogs in order to test the plasticity and the capacity to generalize signals. Cross-pointing and elbow cross-pointing can be understood by dogs unless movement is added to the signal. This cue is probably less clear for the most characteristic feature of pointing seems to be the protrusion of the hand from the body torso ••. Other experiments have been conducted with dogs using leg and knee pointing . Dogs didn't understand the latter gesture for there was no protruding body part to produce a sufficiently contrasting directional signal. In the case of asymmetric pointing dogs favored the bowl indicated by the pointing gesture and not at which the human was standing ••. Moreover, dogs couldn't understand a stick pointing cue (hands hidden behind the back).These two results underline the informative sense given by dogs to the arm and the hand of their owners when giving an indication. Pointing gestures have been classified in three main kinds of pointing owing to the duration of the gesture: static pointing, dynamic pointing and momentary pointing. In momentary pointing, the subject points in the direction of the chosen object for only 1 or 2 seconds after what the arm comes back at the side of the body before the animal is released. Globally, dogs and cats understand this kind of pointing whatever is the form of the gesture and the distance to the object •••. However, their performance was higher in the case of a sustained gesture. On the contrary, horses have not performed above chance when the gesture was momentary and the object at a distance over 50 cm (distal pointing) •. Some researchers have argued that to be understandable, the signal should be still present when the subject modifies its behavior . This, idea received support in more recent research on horse of course but also on dogs and cats •. Indeed, in any case the momentary gesture demands a better memory to lead to the good choice. In static pointing, the experimenter is already in position when the animal is shown to him and he stays static until the subject has made his choice. This kind of gesture has not been explored very much and the only existent data deals with dogs. Their performance is partially affected ••. If static pointing is combined to a complex form of pointing such as elbow cross-pointing, dogs don't perform above chance. These results suggest that the movement component of the gesture is important but plays a secondary role in dogs' responses ••. The pointing is proximal when the distance between the finger and the correct object is inferior to 50 cm and distal if it is superior to this distance ••. We could hypothesize that distal pointing is harder to understand for animals because the distance makes the direction less clear. In the case of horses, Maros et al. • tested 27 horses in choosing one of two buckets to find food using distal momentary pointing and distal dynamic pointing. Results indicated that horses were able to understand distal pointing only when the signal was not removed before the choice was made. On the other hand, dogs and cats don't seem disturbed by the distance to the target. The very well documented case of Clever Hans is interesting in understanding the importance of body posture. This horse was reportedly able to “count and read” . In fact, Oskar Pfungst  was among the first to show that the horse's abilities were only due to its capacity to perceive the changes in body tension of the human experimenter. Birke et al. • explored the effect of different types of approach style on horses. Change in flight distance (distance at which horses started to avoid an approaching human) was measured when an unknown person was approaching. Body posture (relaxed or tensed) had no effect while the effect of speed of approach was particularly significant. These results suggest that horses have an important egocentric spatial barrier (psychological boundary of which the crossing leads to some form of avoidance response). Moreover, dogs seem to be sensitive to human attitude too . Their reaction was measured in playful and non-playful situations when somebody was approaching in a conflicting or friendly manner. Dogs' responses were in accordance with the human's attitude. They developed aggressive reactions when the human partners' behavior became ambiguous in relation to the context. Therefore, dogs are sensitive to human's body attitude and can link it to the social context in which they are placed. Recently the effect of gazing has been studied in combination with the pointing gesture. It seems that there is a synergic effect of pointing and gazing towards the object. It has been shown in dogs ••, horse • and goats . Indeed, in the case of dogs it has been shown that gaze alternation increase the effect of the pointing gesture. Moreover, during approaching experiments, eye contact had an effect on horses' reactions •. Flight distance was significantly greater when the person was looking away (p=0.045). However, it is difficult to give a real conclusion on the effect of gazing on dogs, because they have never been tested without gazing at all. On the contrary, horses and goats have been tested with gaze only and this cue alone was not sufficient to make them perform above chance ••. Adding a body orientation cue to gazing didn't allow horses to find the bowl containing food neither ••. As a conclusion, gazing is not sufficient in itself to communicate with horses and goats but it has to be tested on dogs which proved to have better communicative skills than the other two domesticated species. Pointing combined with gazing in direction of the object increases the performance of animals. It has been argued that the performance of subjects improved when cues were accompanied by audible sounds . However, this conclusion has been drawn on the basis of experiments on chimpanzees. Recently, horses •• and goats  have been tested with only a tapping cue to detect a container in which food was hidden. Goats performed above chance on the contrary to horse. It is possible that in the last case some subjects avoided the cued container deliberately. Indeed, some subjects may have interpreted the tapping on the bucket and the direct gazing towards them as a demonstration of possession. They might have perceived a competitive situation and tried to flee the confrontation. The effect of vocal enhancement in pointing experiment has not been tested on dogs but might improve their performance. We have seen that between the different domesticated species studied, dogs seem to have the best ability to use human-given cues in an object choice task. Horses and goats have similar capacities which are less developed than the dogs' ones. In any case, it has been argued that local stimulus enhancement, gaze following response and memory were probably playing a role in the cognitive processing of the gestural cue ••. Different hypothesis have been reviewed in recent studies to explain the cognitive mechanisms of inter-specific communication. The boosters of this hypothesis assume that subjects use simple behavioral automatisms to find the goal object of the signal in space by using observable visual cues ••. Animals' communicative skills could be considered as associative learning situations in which the subject drawn a link between a cue and a reward. In other terms, communication with humans would be a simple conditioning process. It has been shown that horses were able to use pointing but didn't understand gaze alternation and body orientation cues ••. This could indicate that horse only use stimulus enhancement to choose the correct container which is a quite basic cognitive mechanism supporting low-level hypothesis. Moreover, in both this study and in the one of McKinley and Sambrook , horses initially approached the human and then turned their head towards the pointed bucket. Researchers reported that during the trial the successful horse tended to move his nose down the length of the experimenter's arm, past her hand and then onto the correct bucket”. These observations suggest that horses don't fully understand the communicative nature of the given cues. The hypothesis referred as the “high-level” model of pointing comprehension suggest that the animal perceiving the pointing gesture might attend to the mental state of the pointer and understand the communicative intention of the emitter . This model requires complex cognitive skills for it implies that the subject learns about the meaning of the cues. The highly developed social skills of dogs might be based on this “high-level model”. Indeed, the fact that they respond spontaneously to various forms of pointing and are able to generalize their responses to novel and unfamiliar forms of communication (e.g. 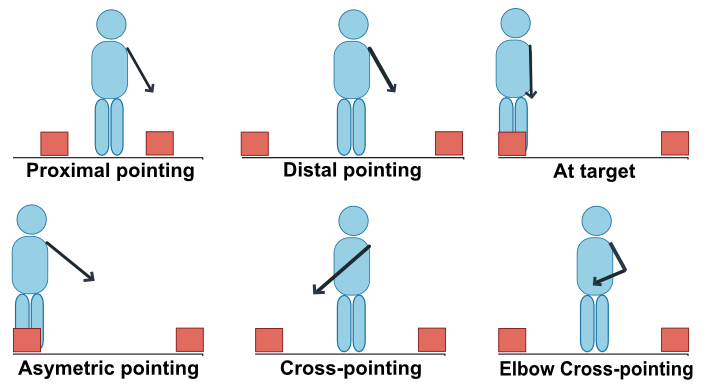 elbow cross-pointing) suggest that they have a referential understanding of communicative cues . Some researchers are wondering if dogs might possess “Theory of mind” or at least a precursor. This theory refers to the ability to impute mental state to others and to reason about the relationship between these mental states and subsequent behavior. Indeed, dogs are more inclined to rob forbidden food if the human close to him is not watching or distracted •. Also, when dogs are facing an insoluble problem they look back at the experimenter, as if they were soliciting assistance . Finally, dogs can use visual cues to evaluate the attention and responsiveness of a person . However, these intriguing results don't always require awareness of the experimenter's mental state that is why some researchers don't believe that dog fully possess this theory ••. Domesticated species have been artificially selected throughout time for enhanced socio-cognitive abilities which allowed them to live in human social contexts. Therefore it has been shown that these species have an innate ability to perform inter-specific communication with human individuals. For instance, dogs are the descendents of wolves  that have been selected by man and after thousand years of separated evolution it is clear that wolves and dogs differ in their morphology but also in their behavior. We can notice that dogs have kept the juvenile characteristics of wolves such as barking, whining and soliciting attention even as adults. Comparison between dogs and wolves has revealed that even intensive socialization with humans could not overcome natural species differences. In one experiment, dogs and wolves puppies were raised in identical conditions, closely living with humans during their first 3-4 months of life . When dogs and wolves were tested under identical circumstances, young dogs performed better than young wolves to follow pointing gesture. After extensive training only one wolf was able to reach a performance comparable to that of dogs. Moreover it has been shown that 4 months' old dogs raised with limited human contact in puppy kennels were able to understand static proximal pointing gesture . It has been discovered recently that farm animals such as goats were also able to master comprehension of pointing gesture  even if they have had a less intimate contact with human than dogs do. It has also been argued recently that more than a result of domestication, the communicative abilities could be one of its by-product. Animals could have been selected for fearless attitude and lack of aggressiveness whether than directly for their communicative skills. Hare et al. • carried out an artificial selection experiment on a population of foxes which were selected over 45 years for approaching humans fearlessly and non-aggressively, and found that these foxes were just as skilful as dog puppies in using human proximal static pointing gestures. In any case, domestication is not a unified process and the selection response probably depends on the species in question ••. The domestication hypothesis needs further parallels with comparative experiments testing wild and domesticated species in a comparable manner (e. g. dogs versus wolves, pigs versus wild boars). Comparisons between socialized wolves and dogs have shown that dogs tend to initiate eye contact with human more rapidly and for longer periods when facing a choice ••. This can suggest that domesticated species rely on human more than on their reasoning abilities when they have to perform certain choices. However, this behavior is less common with other species such as cats which have not been subject to the same kind of selection during the domestication process •. Szetei et al. • have defined two kinds of cues that can be followed by dogs when looking for hidden food: social and non-social cues. Social cues are related to the behaviour of the experimenter or owner next to them. On the contrary non-social cues relate to the senses of the animal like the sense of smell. Normally, dogs use odour cues to find food hidden in one of the two presented bowls, but studies have shown that the presence of a human between the two bowls alters their performance. In the study of Prato-Previde et al. , dogs were shown to two transparent containers with different amounts of food. In control conditions they chose the one with the higher amount. But the dogs' preference for the other container increased when the owner approached it and made verbal expressions of appetite for it. However, the preference for the bowl marked by the owner was only significant when the two bowls contained the same amount of food. In another experiment •, dogs were placed in a small labyrinth in which one issue leaded to food. Dogs that learned to solve the problem by following a human demonstrator kept imitating the person, even when there was a shorter route to access food. All these studies underline dogs' preference for social cues. Nevertheless it must be noted that the social background of the dogs that were tested was often unknown and could have influenced the result . Nevertheless, this way of always relying on human has been interpreted as the result of a loss of reasoning capacities •[31,32]. Indeed it seems that domestication has induced many morphological and cognitive changes. In captivity, relaxed selection can be expected for behaviors that are important in nature such as predator avoidance, food finding and sheltering because they lose much of their adaptive significance. The capacity for individuals to learn rapidly the consequences of their behavior is one of the main factors that determine fitness in the wild. On the contrary, captive animals can rely on humans who become ever-present providers and who protect pets from the consequences of their mistakes. Domesticated animals are not confronted to natural selection but to an artificial selection which relies more on esthetical and utilitarian arguments than on survival. This could induce a loss of cognitive abilities because animals are selected to perform very specific tasks and they can rely on humans the rest of the time. However, Prato-Previde et al. found that highly trained and older dogs were less inclined to follow their owners' choice in a quantity discrimination task. This experiment shows that, with experience, dogs can learn to choose the most informative cue. They could discriminate the cues (social or not) that will induce the best outcomes in each situation. Learning allows an animal to adapt to variable environment within their life . In the case of domesticated animals, we can infer that juveniles also adapt themselves to the human beings that surround them daily during their development. For instance, dogs learn to respond the human social signals in the course of their everyday life . Moreover, the ability to understand pointing gesture increases with age and there is little evidence that puppies understand it under 21 weeks old •. Therefore, the communicative skills are at least partly due to social learning during puppies' ontogeny. Different types of learning have been experimented with dogs. The “positive reinforcement” takes place when behavior produces positive consequences (e.g. food) and as a consequence the positive outcome increases the likelihood that one engages in this kind of behavior in the future . On the contrary, when behavior doesn't lead to appetitive consequences the probability of the latter behavior decreases. This phenomenon is called “omission”. Finally, there is “an extinction” when behavior stops producing positive consequences (e.g. no food) and when the response decreases [36,37]. Experiments of frustration of dogs have shown the importance of learning in fashioning individual behavior ••. Gaze response of dogs was measured in three types of reinforcement schedules: positive, omission and extinction in a situation of “asking for food”. The positive reinforcement phase induced a significant increase in gaze duration whereas both omission and extinction phases induced a significant decrease. The extinction also resulted in an increase in the distance from the experimenter, the back position and lying behavior. Experiments carried out on horses have also shown the importance of learning the identity of the person approaching in the kind of response that will income. Both naive and experienced horses show the same reaction to an initial approach by an unknown individual and the flight response was initially being triggered at around 2.5 m •. After 6 sessions of experiments the flight distance tended to reduce and the horse oriented more in direction of the experimenter approaching. Therefore, domesticated animals are keener on communicating with people they know whether than unknown individuals who represent a potential danger for them •. This interpretation underlines the importance of the identity of an experimenter in testing the behavior of animals for the response could depend on it. Many experiments have been done lately to show the importance of ontogeny in improving the inter-specific communicative skills of animals. Virányi et al. • compared the performance of wolves at 11 months of age after intensive training with that of naive dogs of the same age. The task consisted in following a momentary distal pointing (the distance from the top of the finger to the object was superior to 50 cm and the signal lasted less than 2 seconds). The number of correct responses, the latency and the maintenance of the gaze to the experimenter who gave the cue were similar for trained wolves and naives dogs. Therefore, wild animals raised and trained in captivity can reach the same degree of understanding than domesticated animals of the same species family. Furthermore, Udell et al. even found that on average, socialized wolves can follow the distal pointing to the same degree as pet dogs tested indoors, and better than dogs tested outdoors and those from a shelter (i.e. with little contact with human compared to dogs raised in human homes). We can notice that dogs are often raised within human families in the same environment than human children. Comparisons between human children and puppies showed a common effect of socialization. For instance, dogs showed similar performances as 2-year old kids in understanding capacities of leg pointing, knee pointing, distal finger pointing and elbow pointing . Some studies on dog-human interaction describe it as an inter-specific parental contact . This interaction referred as “motherese” or “doggerel” is probably the result of the common history of dogs and humans and explains the similarity between social capacities of young human children and puppies. It is difficult to draw objective interpretations out of the great variety of behavioral responses that are observable in animals. In the case of inter-specific communication, comprehension of pointing gesture has been the most reliable way of testing animals' communicative abilities. Dynamic component, duration of the signal until the animal has made his choice, protrusion of the hand from the body torso and proximity to the target seem to be the characteristics of a universally understandable pointing for dogs, cats, horses and even goats. However, the rate of learning and the predisposition to communicate with humans are species-specific skills. Comparative studies with other species ••• suggest that dogs have the best abilities to understand basic cues but also to generalize to other more unfamiliar cues such as elbow cross-pointing. On the contrary to horses, they could understand the communicative nature of the given signals and might attend to the mental state of the experimenter. These communicative abilities that are specially developed in dogs but also define all sorts of domesticated animals could be partly the result of the common life style they have experienced in captive environment. Human has probably artificially selected the ones with better behavior across time. However, improved communicative comprehension is probably the result of the combined effects of long-term domestication and social learning during animals' ontogeny. I am grateful to Morgane Ollivier for providing me helpful and constructive advices on the early version of this article. I also wish to thank the reviewers who contributed in improving this paper. 1. Wilson EO: Sociobiology: The New Synthesis . Harvard University Press; 1975. 2. Darwin C: The Variation of Animals and Plants Under Domestication . John Murray; 1868. 4. Price EO: Behavioral development in animals undergoing domestication . Appl. Anim. Behav. Sci. 1999, 65 :245–271. 5. Clutton-Brock J: Origins of the dog: domestication and early history . In The Domestic Dog: Its Evolution, Behaviour and Interactions with People. Cambridge University Press; 1995:7–20. ●● The authors reviewed pointing experiments results over the past years and classified the different existing pointing gestures adding gaze information. 8. Candland D: Feral children and clever animals. Oxford University Press; 1993. 9. Pfungst O: Clever Hans:(the horse of Mr. Von Osten.) a contribution to experimental animal and human psychology . Holt, Rinehart and Winston; 1911. ● Extensive and reliable study on the comprehension of basic pointing signals by horse. ●● Most recent pointing experiment carried out on horses. New cues have been added compared to old studies : tapping, marker placement, body orientation and gazing alone. 16. McKinley J, Sambrook TD: Use of human-given cues by domestic dogs ( Canis familiaris) and horses ( Equus caballus ) . Anim. Cogn. 2000, 3 :13–22. ● This paper brings evidence in support of “theory of mind” in dogs. 20. Miklósi Á, Kubinyi E, Topál J, Gácsi M, Virányi Z, Csányi V: A simple reason for a big difference: wolves do not look back at humans, but dogs do . Curr. Biol. 2003, 13 :763–766. ●● Most recent review on human-dog communication proposes in highlighting point of view on the “theory of mind” in dogs and the importance of adaptive specialization of learning within the dog species. ● Exceptional study of more than 45 years long on effects of artificial selection on foxes. Support for the “by-product of domestication” hypothesis explaining communicative abilities in domesticated species. ● This study shows the common capacity of dogs and cats to understand several dynamic and momentary pointing gestures. ● Demonstration of the saliency of social cues compared to senses. ● Original experimental procedure showed the preference given to social cues wether than individual observation. 33. Alcock J: Animal behaviour: an evolutionary approach . Sunderland(Mass. ): Sinauer; 1975. ● Disproves the idea that puppies aged under 9 weeks understand pointing gesture. 36. Thorndike EL 1874-1949: Animal Intelligence; Experimental Studies . BiblioBazaar; 2010. 37. Skinner BF: Science And Human Behavior . Free Press; 2012. ●● This is the first systematic evaluation of dog's response to frustration. It underlines the importance of individual experience in communicative abilities. ● One of the most quoted comparative study of pointing comprehension between dogs and wolves. 43. Hare B, Tomasello M: Domestic dogs, Canis familiaris , use human and conspecific social cues to locate hidden food. J. Comp. Psychol. 1999, 113 :173. 44. Hauser MD: The Evolution of Communication . MIT Press; 1996. ●● Use of complex pointing gestures to evaluate dogs plasticity in understanding human signals. This study shows the importance of protruding body part s in the comprehension of pointing.